How much do mobile bars cost? The weather’s been teasing us recently with a peepshow of 20 degree sun forecasts, early-blooming daffs and not a free table in sight in the UK's pub gardens. Summer feels so close you can almost taste that Pimm’s can’t you? Heaven. Well why wait? Bring the summer party early and pop some bottles goddammit! We’ve had a tough time of it in the UK over the past two years what with Brexit looming over us and KFC running out of chicken - we need some liquid loving and we need it now. 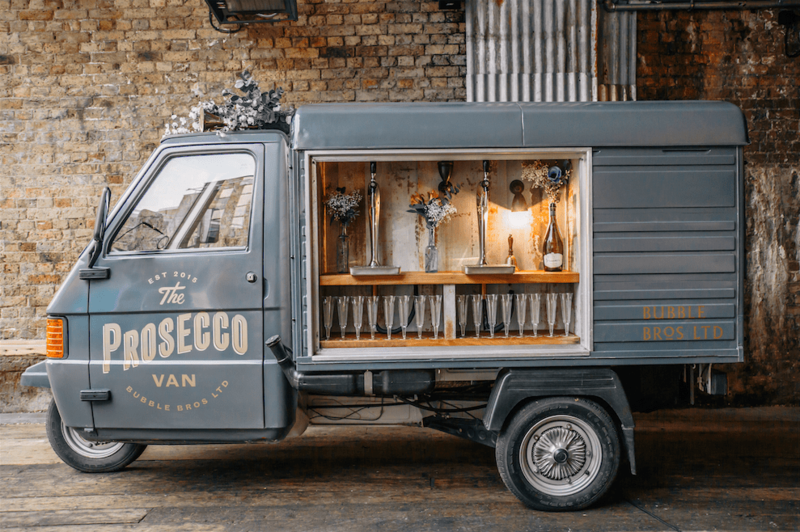 Fancy a vintage prosecco van at your woodland wedding? How about disco on wheels with music and incredible cocktails to boot? Deep and moreish hot chocolate served at your sweet sixteenth? Or fresh, nutritious juices for your corporate team building day? THOUGHT SO! 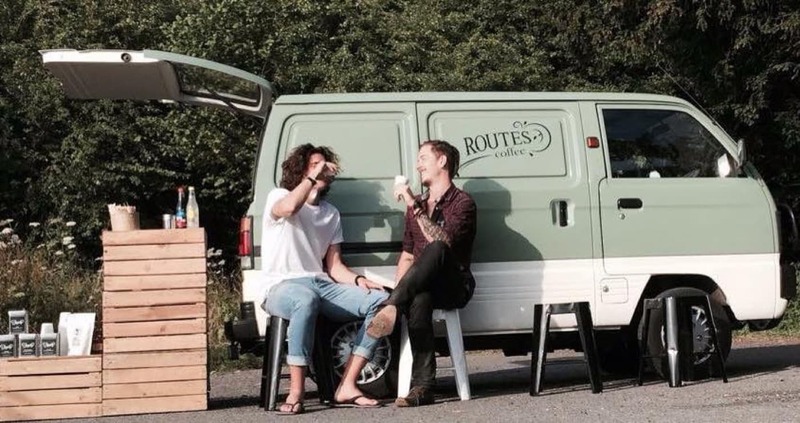 The sound of one of our funky and delicious mobile bars pulling up to the curb and knocking the socks off your next event is only a simple booking away. 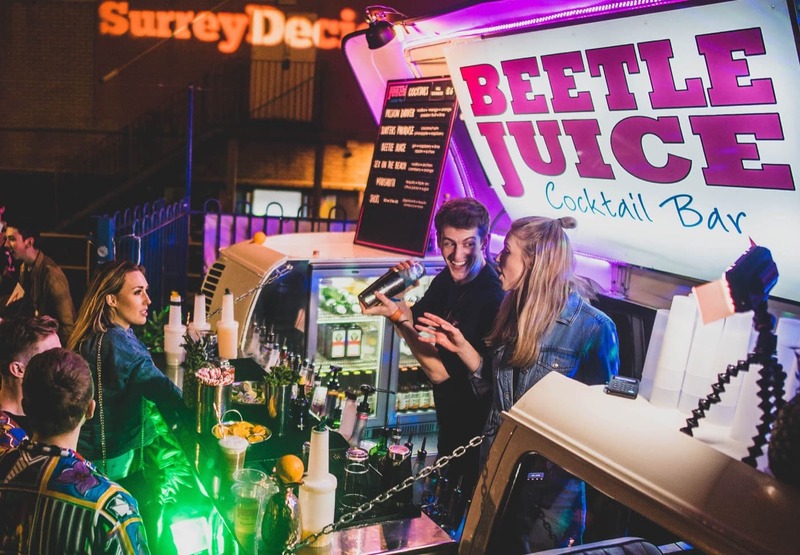 The question our events pros get asked most often is ‘Sounds amazing but how much do mobile bars actually cost?’ Wonder no more thirsty friends, we have your answers right here alongside some other questions you may have been pondering over! Want to cut the chat and get straight down with the trumpets, a tequila sunrise in hand? No qualms, you can browse all of our amazing mobile bar suppliers here. So, how much does a mobile bar cost? Depending on how many guests you have coming to your event and the type of beverage you want served, the cost can vary a lot. As a guideline though, tipsy alcoholic tipples of the wine, beer and spirit variety will usually cost between £5-£10 per drink for you and your party people. Cocktails are more likely to fall around the £8-£12 per drink mark, and drinks packages can range from £15-30 per person depending on the type and number of drinks you're after. Hot drinks, such as coffee and hot chocolate, cost approximately £2.50 to £3 per item, and soft drinks, such as juices and smoothies, cost roughly £3 to £4 - bargain. Why not give our event pros a call or enquire online so that we can give you a clearer answer according to which drinks supplier you want to book! What exactly does a mobile bar booking include? Our drinks suppliers will bring everything they need to the venue. 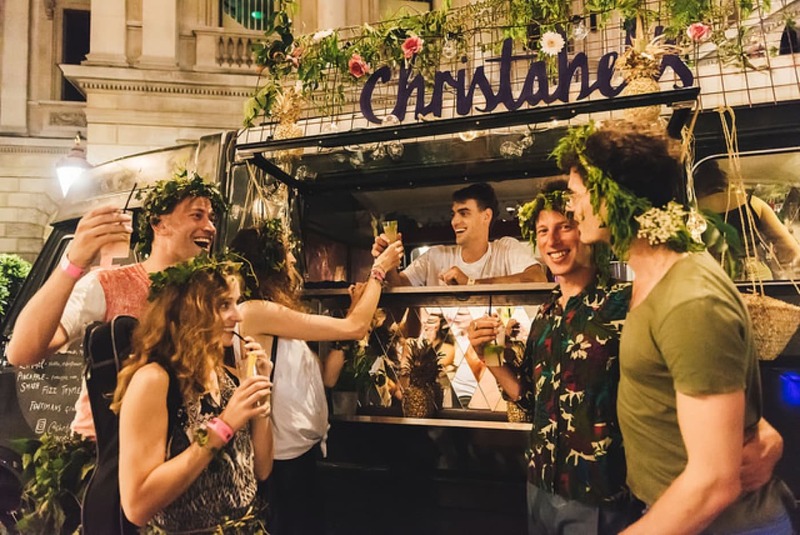 They’ll pull up to the curb in their eye-catching centrepiece of a mobile bar, bring all their own drinks and garnishes, haul their equipment down to your event and bring the funky glasses and containers to serve up your event’s drinks menu. If there’s anything very particular that you want, like personalised birthday girl prosecco glasses, you might have to provide them yourself! Just chat to the supplier on our event catering platform and they’ll let you know what’s what before the big day arrives! 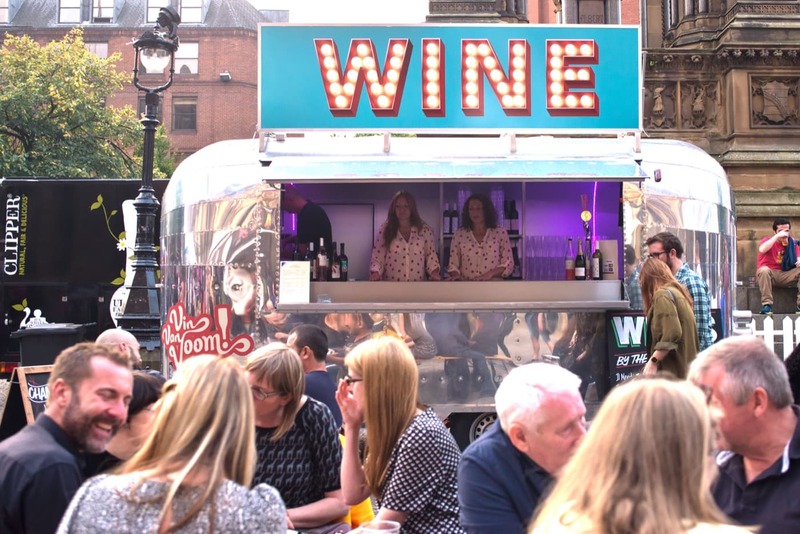 Do Feast It mobile bars serve alcoholic and non-alcoholic drinks? Don’t sweat it - we’ve got a bit of everything to whet your appetite. Asides from bubbles, cocktails and gin galore, we serve a plethora of party-friendly and corporate-ready bevs. You can put that Becks Blue in the bin, we’ve got plenty of mocktail and soft drinks available for your guests! Check out our blog Tipsy or Teetotal: A guide to drinks innovators who serve the best of both for inspo! We also have loads of hot drink mobile bars which may be more suited to your event which are equally as cool, Insta-ready and delicious. From Filtr, to Routes Coffee and Bean & Gone - you’re in safe (and warm) hands! You can browse these guys HERE. 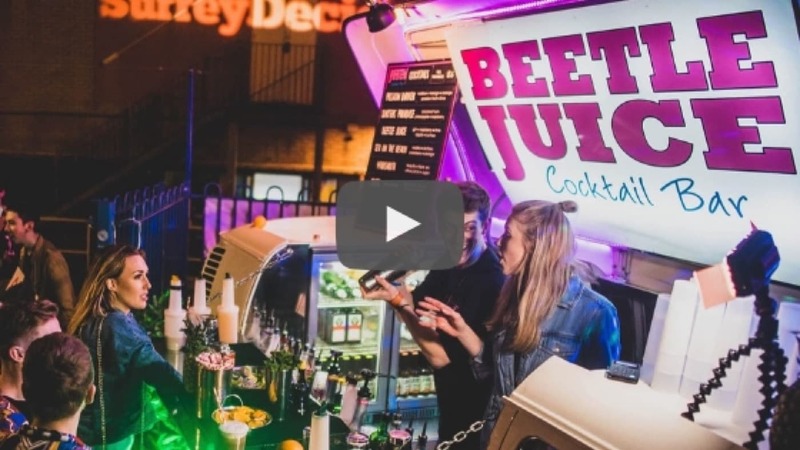 Your wish has been granted - let us quench your intrigue with the latest video in our Supplier Series which showcases the incredible Beetle Juice Cocktail Bar in action! Beetle Juice brings the party to the people! These guys are absolute experts in creating a bespoke environment where you and your guests won't have to worry about the drinks or even the entertainment. They've a whole load of amazing 1970s VW Vans that have been converted into bars that would be an awesome addition to any event. They tailor-make the cocktails for your party and will come fully stocked with background bar music, staff, premium disposables, and a fully stocked bar with fruit, garnish and ice - what more could you want? Want to see more about Beetle Juice? Look at a sample menu, images and more here! Find your perfect mobile bar! Now you know the ropes, why don't you check out our full selection of mobile bars? You can find them all HERE - browse away! Found your centre piece party starter already? Enquire here and one of our team of dedicated Account Managers can help you get the wheels in motion and talk you through your next steps towards making your next event one to remember!